The 21-year-old old stands accused of killing his parents and older brother in a horrifying axe attack. Henri van Breda appeared in the Western Cape High Court on Friday on charges of killing his parents and older brother. UPDATE: Henri appeared in court for less than 10 minutes. The pretrial hearing has been postponed until 3 February next year. The 21-year-old faces three counts of murder, one of attempted murder, and one of obstructing the course of justice. He handed himself to police in June and was granted bail of R100 000 on June 14. His parents, Martin (54) and Teresa (55) and his brother Rudi (22) were killed with an axe in their home on the luxury De Zalze golf estate in Stellenbosch in the early hours of Tuesday, January 27, 2015. His sister Marli (17) survived the attack, but sustained serious brain injuries. She is on the list of State witnesses expected to testify against him. She suffered from retrograde amnesia and it was still unclear if she would be able to remember anything about what happened that morning. After Marli's recovery, she saw her brother briefly. However, the two were separated again. One of Henri's bail conditions was that he could not contact anyone on the list of witnesses until the end of his trial. 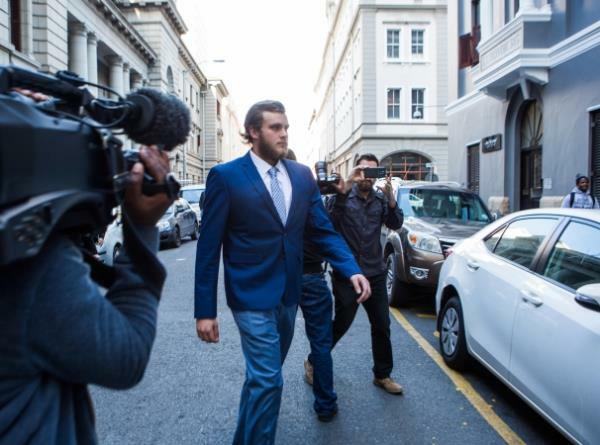 Van Breda and his girlfriend Danielle Janse van Rensburg appeared in the Cape Town Magistrate's Court on October 19 on a charge of possession of dagga. They were arrested in September. The court asked for him to be assessed by the South African National Institute for Crime Prevention and the Reintegration of Offenders (Nicro). The case was postponed to April 11.